Not everything Google does with its browser is acceptable for everyone. If you don't want to have your private data collected and used for marketing purposes, you might want to consider switching to a different web browser. Superbird Browser is an excellent choice due to its familiar design and functionality. It's based on Chromium, which makes it almost identical to Google Chrome, except for the fact that Superbird doesn't spy on you. You can enjoy your favorite websites without feeling unsafe, and the best part is that it won't feel like you've changed browsers. Downloading and installing Superbird Browser doesn't take more than a minute, and it doesn't involve any complicated configurations. It works on all modern Windows platforms, and it doesn't rely on any special tools or services, so you can launch it immediately after you've installed it. The browser doesn't look too different than Google Chrome. You have the same layout and options, so you don't have to spend any time looking around to familiarize yourself. You can type the addresses of the websites you want to visit in the address bar and open additional tabs if you wish to explore multiple pages at the same time. You can also use the address bar to search for information on the web. In other words, the software looks and works just like Google Chrome, which is not surprising since it's based on Chromium. The default search engine is set to Bing, but you can switch to your preferred search provider in the browser's settings menu. You can even sign into your Google account if you want to synchronize the bookmarks you have in Chrome. While you're in the settings menu, you might want to have a look around and see how the software handles your privacy and security. Everything is well explained, and you can enable or disable any feature at a moment's notice, by simply clicking an on/off switch. What's more, the software gives you quick access to the Chrome Web Store, so you can expand its functionality with various plug-ins. If you don't like Chrome's data collection functionality, but don't want to switch to another browser, Superbird Browser is an excellent compromise. 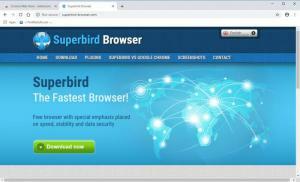 Superbird Browser lets you surf the web without collecting your personal data. The software has a familiar design, so you don't have to learn a new layout. The browser doesn't do anything on the surface to look like something more than Chrome with tweaked settings. You can download Superbird Browser free here.